One Shiny Acorn | No Chic. Just Geek. When it comes to black ironies in the realm of life-transcending-art, the recent, tragic death of Paul Walker takes some beating – I think you’d have to have Christopher Lambert being decapitated in a duel or Sigourney Weaver being killed by an extra-terrestrial parasite to even come close. Walker owed his celebrity almost entirely to an association with fast cars and dangerous driving; nevertheless his death still comes as a shock, not least because it feels so darkly apposite. By a weird and rather bleak coincidence, the original The Fast and the Furious arrived as part of my DVD rental package only the other day. The idea that I’d end up writing about it as some kind of tribute to Walker had never crossed my mind, obviously; I might even have found the idea laughable, not least because Walker’s contribution always struck me as by far the most dispensable element of the Fast and Furious formula. Having said that – obviously, if you were going to pick one of the Fast and Furious films as a showcase for Walker’s talents, you’d pick number two, mainly because he’s indisputably the leading man in that one. But surely no-one would honestly claim that it’s the best of the series, quite possibly for that very same reason. The first film, on the other hand, also gives Walker a very healthy chunk of the action, and has some stuff going for it which more recent, louder instalments are entirely lacking in. Even the studio heads at Universal will happily admit that the Fast and Furious franchise has been pretty comprehensively retooled in the course of the last few films. Rather than a cheerfully, brazenly absurd exercise in globetrotting and industrial-scale carnage, The Fast and the Furious is a rather more down-to-earth attempt at an action drama. Anyone only familiar with later films may find it a slightly discombobulating experience – to say nothing of the fact that one of the major plot twists won’t be remotely surprising. However, Brian has a secret, and this is where I spoil the movie, by the way. He is actually an undercover cop, attempting to discover who has been hijacking trucks in the LA area using precision driving techniques and souped-up cars. Toretto and his crew are the prime suspects, hence the attempt to infiltrate the group. But as his investigation proceeds – or, rather, stalls – Brian finds himself questioning his own loyalty, increasingly finding himself coming to respect Toretto as a man, and feeling something rather deeper for his sister. Will he be able to bring them in if it turns out they are guilty? Well, given they have made five sequels to date, with filming on another in progress (and several more after that planned, prior to Walker’s death at least), I’ll leave you to work out which way Brian eventually jumps. 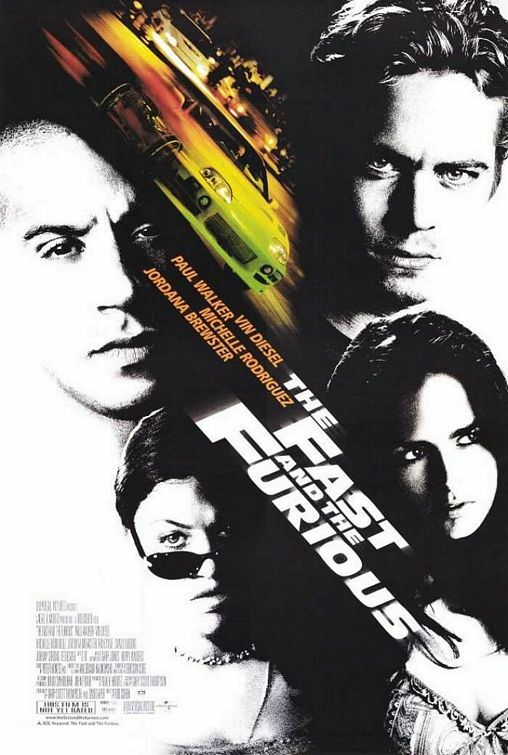 Grit and realism are relative things when it comes to this kind of movie, and while The Fast and the Furious still looks like a garish pop-video in places, with some slightly cartoony racing sequences, it has a hard, slightly sleazy edge, and is notably short on the laws-of-physics-punishing stunts and supernaturally long runways which were so prominent in its most recent progeny. The biggest difference is that this isn’t ultimately some sort of absurd caper movie, but an attempt at an action drama based on the personalities of the characters involved. All right, so everyone drives flashy cars and dresses stylishly, but the meat of the story is still about Brian’s growing friendship with Toretto, his romance with Mia, and his reluctance to believe that they could be the people he’s been ordered to bring down. The street racing and long, loving shots of carburettors being disassembled are basically just trappings for one guy having a bit of an existential crisis. I had a bit of a go at Fast and Furious 6 for its fixation on family as a theme – but it was there in the first one, too, and rather more effectively realised. Perhaps this is why the intrusion into the film of exactly the kind of stunts and action sequences one would expect feels like the main problem with it. There’s certainly something strange going on in a movie when the prime suspect for a crime turns out to be guilty and it feels like a weird plot twist. It’s disconcerting when Toretto and his team are revealed to be the hijackers after all – they’re so obviously capable of it that the revelation that they’re guilty is completely wrong-footing, every rule of genre plotting insists that it should turn out to be someone else. But no. It’s them, and as a result Brian looks a bit of a tool for protesting their innocence to his bosses. When the stunts and chases began in earnest I got a real sense of the film starting to unravel – the action is competently done, but very generic, and as one chase succeeds another in quick succession with only the most peremptory plotting involved, the film’s previous emphasis on characterisation and atmosphere feels like it’s being squandered. Still, this was where the future for these films lay, for all that it’s the climax of this original one that’s the least involving part. Vin Diesel is still top-billed, and you can kind of see why: he is the fulcrum of the plot and exerts his usual massive presence and charisma (playing D&D will grant that to a person). But Paul Walker gets more screen-time, and he’s the audience identification character – let’s face it, he’s the hero! This kind of film does not make the greatest demands of its performers, of course, but it still requires a sort of minimum level of competency from them. Walker comfortably exceeds that level – as does Diesel, of course – and if it’s fairly clear from this outing that he was never quite going to be top banana in this series, he certainly isn’t a disgrace to it, either. No-one seems to be quite sure what’s going to happen to the Fast and Furious series following Walker’s death – there hasn’t been any word yet as to whether enough of the seventh film had been shot to make it viable as originally scripted – but I could easily understand the reluctance of the other members of the ensemble to continue blithely turning them out in Walker’s absence. These are the films Paul Walker will be remembered for, anyway: and there are much worse monuments to leave behind. They are genre movies with bags of energy and a touch of class – and this first one has an unexpected depth to it, as well.